SteamGifts.com is a PC gaming community based on the Steam platform, with a focus on user giveaways and discussions. Over the past six years, the site has grown to over one million users, which have generously sent millions of Steam gifts to fellow members in the community. This Patreon is for fans of SteamGifts that would like to contribute to the project. This will help to cover both the cost of operation and development time. In return, a number of rewards are available to those that contribute as a way of thanking everyone for their support. As the name suggests, this reward will remove all third-party advertising across the site. This will provide you with faster load times and increased privacy. Google Analytics will be removed. This will help to improve site performance and increase privacy if you are looking to reduce your online footprint. You will have the option to enable a donator tag (represented by a star icon). This tag will appear next to your username in comments and discussions, as a way of showing your support for the site. This reward will allow you to manually select the colors for your SteamGifts profile. You will have the ability to select the color for the following: background, text links, and avatar border. Customize the border surrounding your avatar on your SteamGifts profile. You will be able to control the border style (solid, dotted, dashed, or double line), the border width, and the radius of each corner to customize the shape. 25 animated GIFs will be available for you to choose from. The GIF you select will be displayed to the winners of your giveaways instead of the default animated space cat. You will be able to choose from a list of 100 animated GIFs which can be displayed to your giveaway winners. This provides you with 75 more GIF options than the previous reward tier. 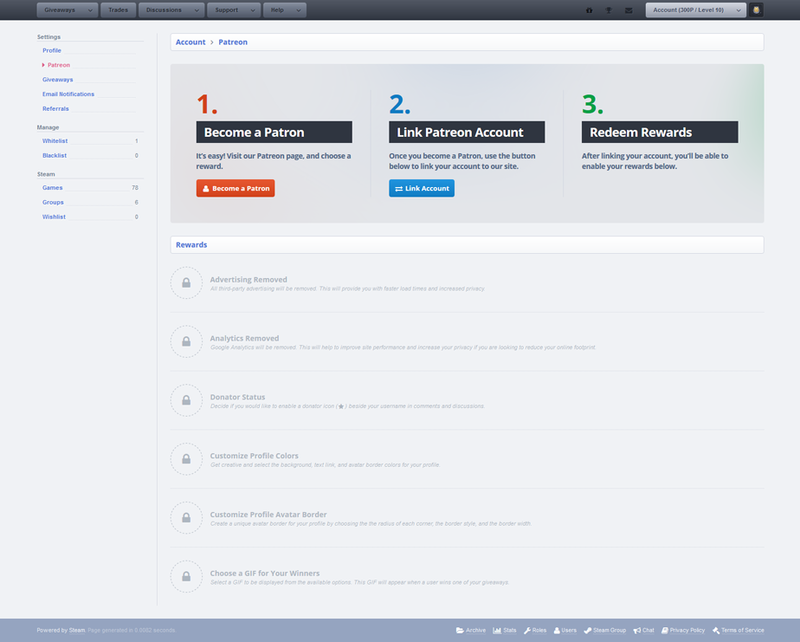 To redeem your rewards you will start by linking your Patreon account to your SteamGifts account using the below steps. Navigate to the Patreon settings on your SteamGifts account page. Click the blue "Link Account" button. 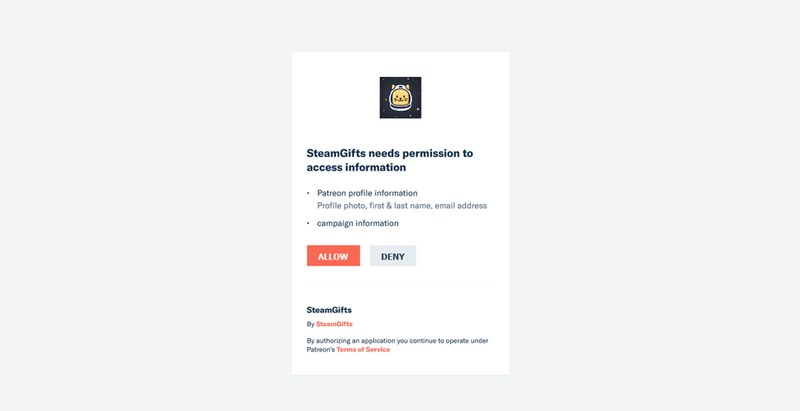 After clicking the "Link Account" button you will be redirected to Patreon, where you will grant SteamGifts permission to your reward information. Clicking the "Allow" button will complete the process, and you will be redirected back to SteamGifts. Your reward tier will now be displayed, with the corresponding rewards unlocked. 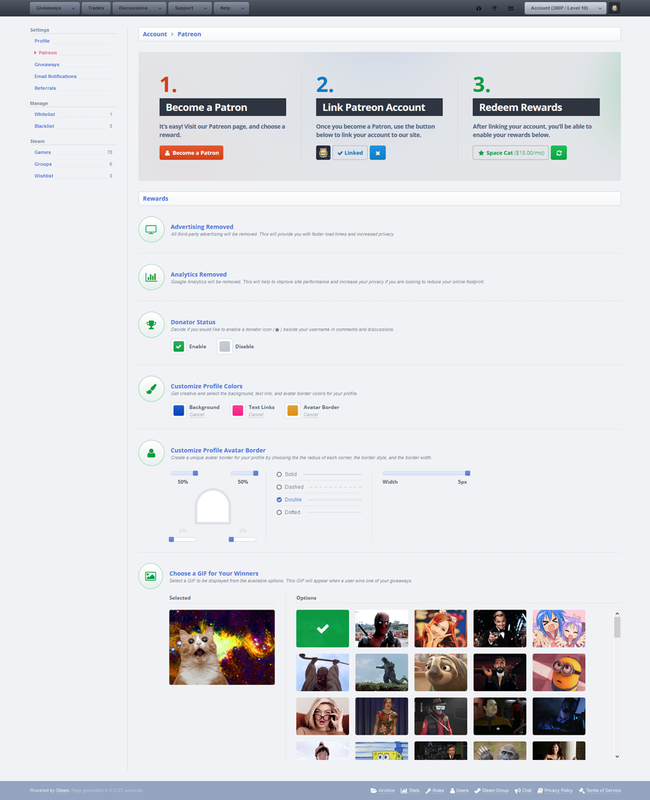 If at any time you decide to change your reward on Patreon, you can use the green button to refresh your information. I wish to thank everyone who has taken the time to be a part of SteamGifts over the years. The site only exists thanks to those sharing giveaways, and volunteering their time to support the community.